Only twenty-five miles long and twenty miles wide across its base, Bataan is ideally suited for defensive warfare. It is jungled and mountainous, cut by numerous streams and deep ravines, and has only two roads adequate for motor vehicles. Dominating the peninsula are two extinct volcanoes: the 4,222-foot high Mt. Natib in the north and, to the south, the Mariveles Mountains whose highest peak, Mt. Bataan, towers to a height of 4,722 feet. Along the east coast, on the Manila Bay side, the peninsula is flat and swampy near its base but becomes hilly and rugged to the south. The coastal plain on the west is extremely narrow. Here the mountains extend almost to the sea; high cliffs guard the shore and toothlike promontories jut into the water. Radiating from the two volcanic masses flow many streams which wind their way through steep ravines and gullies toward the bay and the sea. The Mabatang-Mauban line, or Abucay- Mauban line, as it was more generally called, the main battle position, occupied on 7 January, was not a continuous line. Separating and forming an almost impenetrable barrier between the left portion held by I Corps and the right portion held by II Corps was the northernmost of the two extinct volcanoes, covering an area about fifteen by fifteen miles. Around the crater are steep and jagged peaks rising to a height of 3,000 to 4,000 feet. The northernmost peak, Mt. Santa Rosa, is 3,052 feet high. About three and a half miles southeast is the highest point on the crater's edge, Mt. Natib. In a distance of 2,000 yards this 4,222-foot-high mountain drops to half its height. Mt. Silanganan, to the southwest, is 3,620 feet high. On its west escarpment this land mass drops a thousand feet in as many yards. Though the military crests of these mountains provided ideal defensive positions- one officer called them "an infantryman's dream"-they made effective mutual support between the two corps impossible. The Mt. Natib position was selected, despite its known limitations, because strategy required that a stand be made here to gain time to prepare the rear battle position and to retain as long as possible the lateral communication provided by the Pilar-Bagac road. In commenting on the first draft of the field order establishing this line, Colonel Casey, MacArthur's engineer officer, urged that the main line be placed further north, at Moron. Noting the excellent beach between Moron and Mauban and recognizing the danger of envelopment at Moron, he pointed out that "if the rear position [Mauban] only is held, it permits the concentration of enemy on these beaches for attack on this flank. "16 He had recommended therefore that Moron be "organized and defended" and the Mauban line used as a switch position. 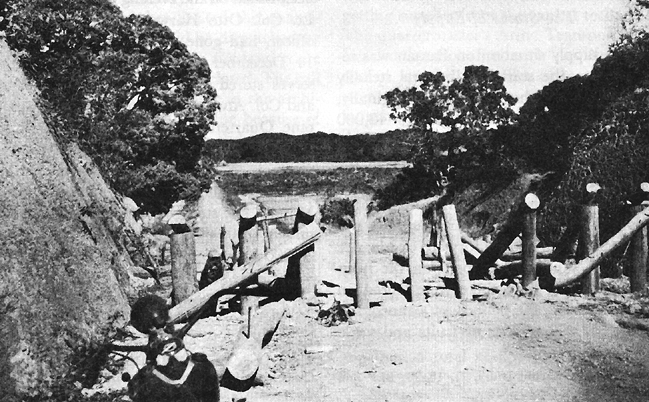 roadblock near the Mauban line. By the end of the first week in January the main battle position on Bataan was organized and the troops in place. 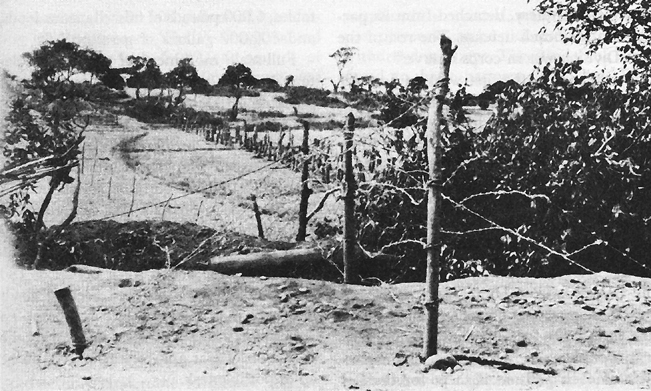 The Japanese, who on the 7th had taken Layac Junction, the gateway to Bataan, were already in position to move against the American line. "It was felt," wrote Colonel Collier, "that the enemy would continue his close follow up of our troops and launch an early push against the right of the II Corps [along] the East Road. "32 Unlike the rest of Luzon, Bataan offered no room for maneuver and little space for withdrawal. The Japanese would have to be held as long as possible at each position. Except for the few who would be fortunate enough to reach Corregidor, there was no retreat from Bataan. 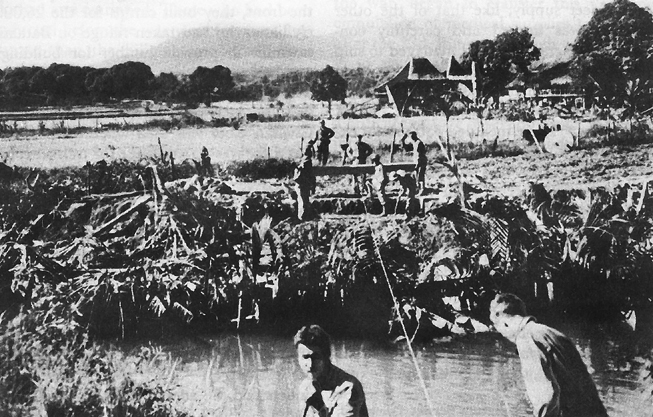 Full-scale movement of supplies to Bataan did not begin until the decision was made on 23 December to withdraw to Bataan. By that time the number of troops to be supplied during the siege of Bataan had increased from the planned 43,000 to almost 80,000, in addition to about 26,000 civilians who had fled to Bataan to escape the invading army. Moving to Bataan enough food and supplies to keep so large a force in action for a period of 180 days would have been extremely difficult under the most favorable circumstances. To accomplish it in about one week, during the confusion of war and retreat, proved to be an impossible task. The large-scale movement of supplies to Bataan and Corregidor began after 23 December. First Corregidor was stocked with enough reserves to supply 10,000 men for six months. This task required only one day since the island already had rations for 7,000 men. The movement of supplies to Bataan was more difficult, largely because of transportation problems, the brief period of time in which to accomplish the task, and the size of the shipments. 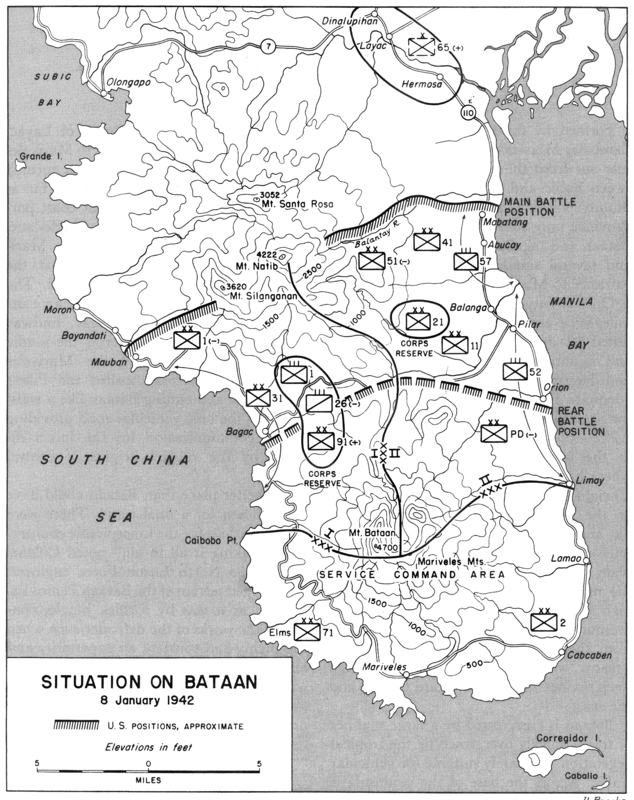 The only land route to Bataan was the one being used by the retreating troops. Until 31 December the roads to San Fernando and into the peninsula could be used, but with difficulty. The shortage of motor vehicles further limited the quantities of supplies that could be dispatched by this means. After that date the land route from Manila to Bataan was closed. The rail net north of Manila, the best in the archipelago, proved of limited value because of the shortage of rolling stock and the desertion of train and engine crews. Most of the supplies for Bataan came from Manila, where the port area with its large warehouses and loaded ships was filled with stores of all kinds. Bataan, only thirty miles away across the bay, could be reached easily by almost every type of vessel. With the shortage of motor and rail transportation, water transport become the chief means of getting supplies from the capital to Bataan. The quartermaster's Army Transport Service, led by Col. Frederick A. Ward and staffed largely by civilian volunteers, took over all the available barges, tugs, and launches and used them for the journey. The first two were slow, but they had the advantage of being easily unloaded at the three piers on Bataan where dock facilities were primitive. tons of supplies was shipped to Bataan and Corregidor by barge and unloaded by the time the Japanese occupied Manila on 2 January. At the time the decision was made to withdraw to Bataan, ammunition and food appeared to be the most critical items of supply and they were accorded first priority. Second priority went to defense materials and to gasoline. All other supplies were given third priority. When rations and ammunition had been shipped, medical supplies, demolitions, barbed wire, and gasoline moved to the top of the priority list. The supply of clothing on Bataan, while not as alarming as the shortage of food, was just as limited. It had been scanty at the beginning of the war and was almost gone by the time the men reached Bataan. The regular garrison of U.S. Army troops and Philippine Scouts had been comparatively well clad when they took the field, but the Philippine Army had been only partially clothed and equipped. Those who had been inducted before the war were far more fortunate than the Filipinos mobilized after hostilities began. The uniforms and equipment of these men consisted of odds and ends, whatever was on hand for issue and whatever they could salvage or buy. Early in January the Quartermaster had only 10,000 pairs of trousers and shorts and an equal number of shirts and blue denim suits. Obviously this amount of clothing was hardly enough for 80,000 men fighting in heavy jungle and mountains, in a wet climate where days were hot and nights cold, and where tangled vegetation quickly tore shirts and trousers. The army service shoe, of which there were 50,000 pairs on Bataan, was of little use to the Filipino soldier whose feet were too narrow for footgear built on American lasts. The absence of mosquito netting, shelter halves, blankets, and sun helmets was as serious as the shortage of clothing. The physical deterioration of the troops and the high incidence of malaria, hookworm, and other diseases were caused as much perhaps by the lack of proper protection against the weather and the jungle as the unbalanced and deficient diet. The supply of petroleum products on Bataan was adequate for several months if strict economy was practiced. During the first week or two on Bataan there was no control over the use of gasoline. When it was discovered that stocks were being depleted at the rate of 14,000 gallons a day, the supply was closely rationed. Ultimately the consumption of gasoline was reduced to 4,000, then 3,000 gallons daily. Engineer supply, like that of the other services, was limited and carefully controlled. The engineers had managed to ship to Bataan and Corregidor more than 10,000 tons of their supplies, in addition to organizational equipment, by the end of December.48 These included 350 tons of explosives, 800 tons of valuable barbed wire, 200 tons of burlap bags for use as sandbags, and large quantities of lumber, construction material, and depot stocks. 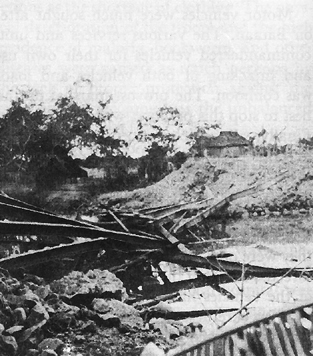 During the withdrawal, engineer supplies had been evacuated from advance depots along the route of retreat and moved to Lubao, a short distance north of Bataan. From there they were to be transferred to two locations on Bataan. Despite congestion along the roads, the shortage of transportation, and the confusion of retreat, the final evacuation of engineer supplies from the Lubao depot was completed by 6 January. 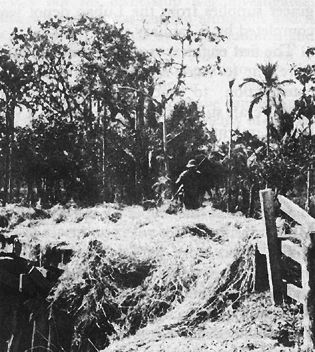 The shortage of supplies of all types, and especially of food, had a greater effect on the outcome of the siege of Bataan than any other single factor. "Each day's combat, each day's output of physical energy," wrote one officer in his diary, "took its toll of the human body-a toll which could not be repaired. . . ."51 When this fact is understood, he added, the story of Bataan is told. remains of a steel bridge; bottom, foundation for a temporary bridge is prepared. Southern Army had stripped General Homma of some of his best ground and air units just before the start of the battle of Bataan. All he had left was the 16th Division, which "did not have a very good reputation" for its "fighting qualities," the 65th Brigade, the 7th Tank Regiment, supporting arms and services, and a small air unit of less than seventy fighters, bombers, and reconnaissance planes.60 Only in the air were the Japanese assured of superiority. no reason to believe that the Americans and Filipinos had constructed any strong installations on Bataan. installations in the Mariveles area.69 The 16th Division was to "cooperate" with the 65th Brigade by "sending a portion of the division to occupy the strategic ground in the vicinity of Ternate and Nasugbu. "70 The occupation of Ternate, on the south shore of Manila Bay, and of Nasugbu to its south would have the effect of cutting communication between Corregidor and southern Luzon. At noon 4 January General Homma had ordered the 65th Brigade to move down Route 74 to the main battle position to relieve the 48th Division and take command of the Takahashi Detachment and the 9th Independent Heavy Artillery Battalion. Nara apparently understood then that his unit was to relieve the 48th Division, for his orders were to "destroy the enemy," send his main force toward Balanga, and make a secondary effort toward Olongapo.71 Final orders for the relief of the 48th Division were issued at 0800 of the 7th. At that time General Nara was again instructed to move toward Olongapo and Balanga. By 1800 of 8 January the brigade had completed its relief of the 48th and was concentrated between Dinalupihan and Hermosa, preparing to attack.72 The next afternoon the assault would begin.